Follow the Monkey | Thoughts On "S"
P26. When S first realizes he has been “stolen from land and deposited on water”, we read his perceptions of “fluid transverse and longitudinal sways”. Transverse and longitudinal are the two ways that waves travel. Sound waves can travel as either. This is literally the physics of sound. In the alternate ending to Chapter 10, S thinks the physics of sound finally cooperates. P352. As Anca writes follow the monkey, Jen’s corresponding note is sound advice. P194. As S and Corbeau navigate the S-curve in the caves of the K–, they can hear the rumble of ocean waves growing louder. Robert Hooke, who has come up in S-research before, was the first to propose that light existed as a wave. He was also the first to look at cork (sobreiro) under a microscope and discover biological cells. The Coriolis Effect produces waves in the ocean. On p221, as S rides a rowboat to El H–, the boat catches a modest wave and S finds himself feeling glorious, even telling the rower I enjoyed that. P225 mentions that the “time travel” is occurring is as if S accelerated through it, as if carried along on the crest of a wave. P84. 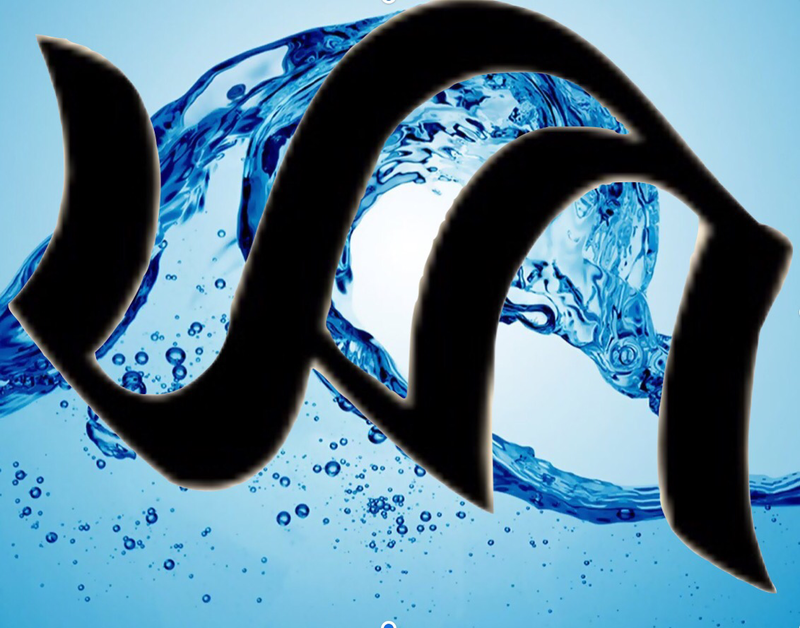 Wave comes from the same root word as weave. Compare to FXC’s choice of Serge as the made-up name choice in the footnote. Serge is a specific weave. On p18: wend is also a form of wave/weave. When S is in the tavern stealing glances at Sola, “he watches as the drops of water fall from him onto the uneven floor and wend along it in a rivulet, snaking over and around and between the warped boards.” This is also the same page where the drunken sailor says ’S the truth. The stitches in the sailors mouths are a wave/weave. Maelstrom’s beard is full and wavy as the hairs swirl together and random weaves. Tufting is an ancient weaving technique. Our capuchin monkey friend is tufted. A wave in the water begins there and ends there. It does not travel outside of the water. What begins at the water shall end there, and what ends there shall once more begin. If all this is not enough, the letter S is itself in the shape of a wave. A wave literally is a Ship of Theseus – the wave is still the wave even when it travels through a medium and is formed by completely different particles. The wave metaphor falls in line with The Tradition. “Different story. Same tradition.” (p404) The tradition is a wave that travels through each generation, carrying with it the essence of a common meaning in the same way, but in different manifestations. Is it the same story? Think monomyth where all stories have the same basic truths communicated through the oral and then written word. Each story, though completely “different”, is a manifestation of the same wave used in a previous story. For example, when S sees the S symbol on a building named CENTRAL POWER in the middle of B– (p100), he witnesses a man taking possession of a bomb that will forever change S’s life. In “real life”, you and I are witnesses to the assassination of Archduke Ferdinand (a member of the CENTRAL POWERS) and the beginning of World War 1. It’s the same basic story, but with a different setting, different characters/plot/etc. J.J. Abrams and Doug Dorst have said that “‘S’ is a love letter to the written word.” It appears to be a story that retells all other stories – a story of good versus evil, and the men and women who fight to overcome it and find love in the process. V.M. Straka and F.X. Caldera fighting Bouchard. Eric and Jen fighting Moody. S and Sola fighting Vevoda. 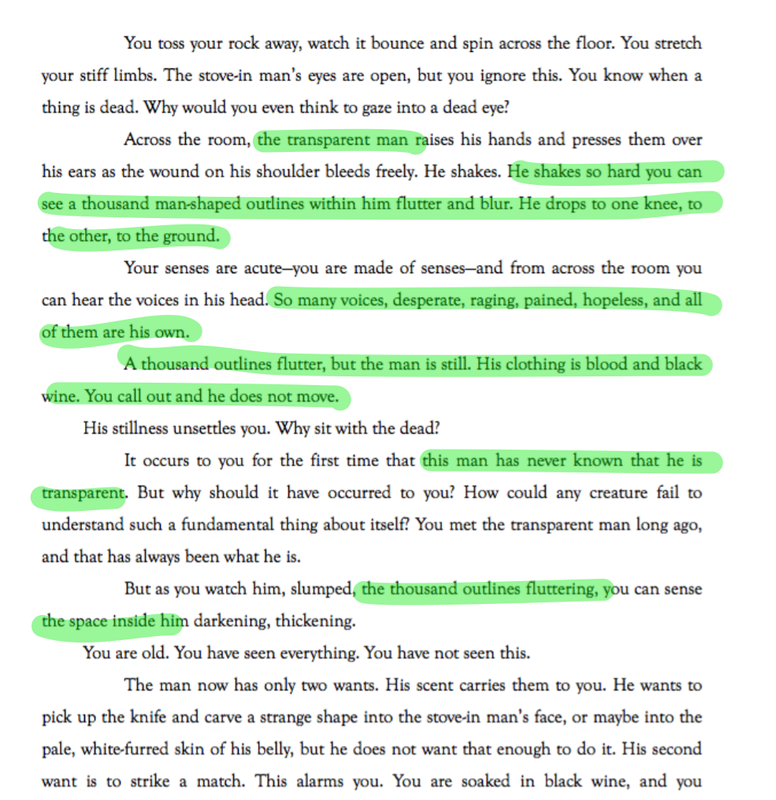 In the alternative ending of Chapter 10 for Ship of Theseus, when the point of view shifts to the monkey, S is referred to as the transparent man. 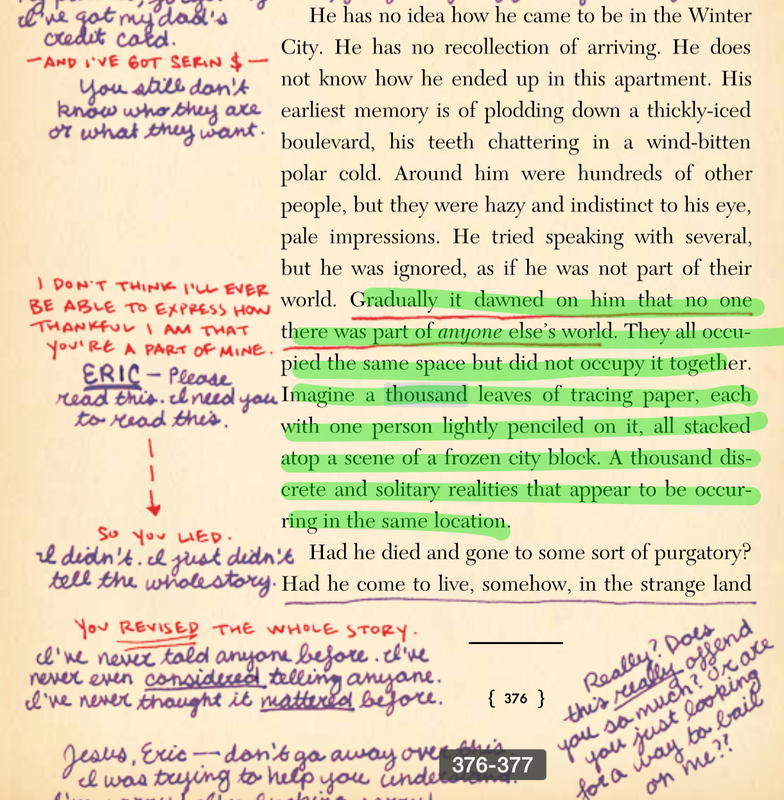 Rather than spoil the mystery with my own musings, I leave you to focus on the following: a portion of p376 from “S” and a portion of the alternative ending – particularly the portions that I have highlighted in green. I encourage you to comment with theories or questions as to what these connections might mean. Standefer Hall will be closed for the first week of the semester due to extensive flooding on the two lower floors, which occurred during the winter break. The flooding was apparently caused by vandalism to water fixtures and pipes throughout the building. According to Lt. Compton, the vandal likely had a key to the building, as there were no signs of forced entry. No alarms were triggered. Video surveillance in the building has been nonoperational for several months, he said, due to a dispute with a contractor, but will come back on line soon. 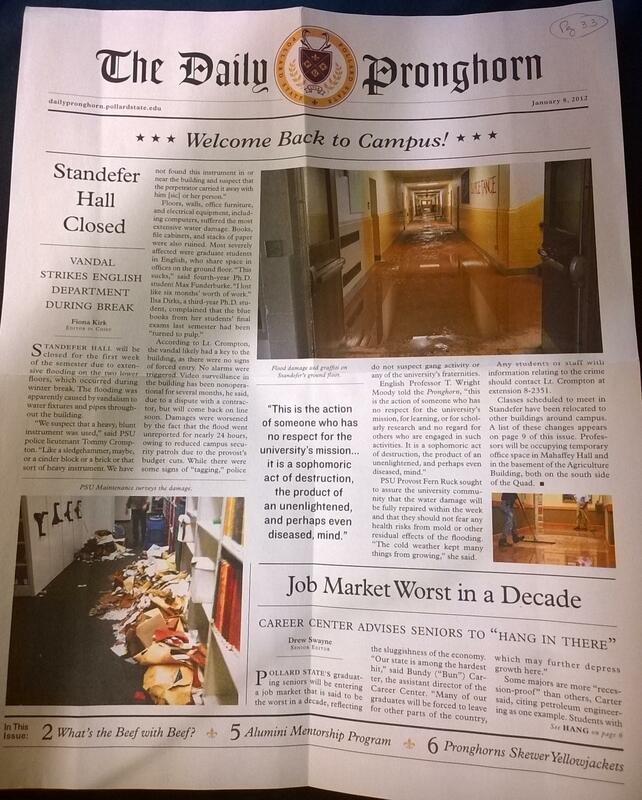 Damages were worsened by the fact that the flood went unreported for nearly 24 hours, owing to reduced campus security patrols due to the provost’s budget cuts. While there were some signs of “tagging,” police do not suspect gang activity or any of the university’s fraternities. PSU Provost Fern Ruck sought to assure the university community that the water damage will be fully repaired within the week and that they should not fear any health risks from mold or other residual effects of the flooding. “The cold weather kept many things from growing,” she said. Any students or staff with information leading to the crime should contact Lt. Compton at extension 8-2351. Classes scheduled to meet in Standefer have been relocated to other buildings around campus. A list of these changes appears on page 9 of this issue. Professors will be occupying temporary office space in Mahaffey Hall and in the basement of the Agriculture Building, both on the south side of the Quad. 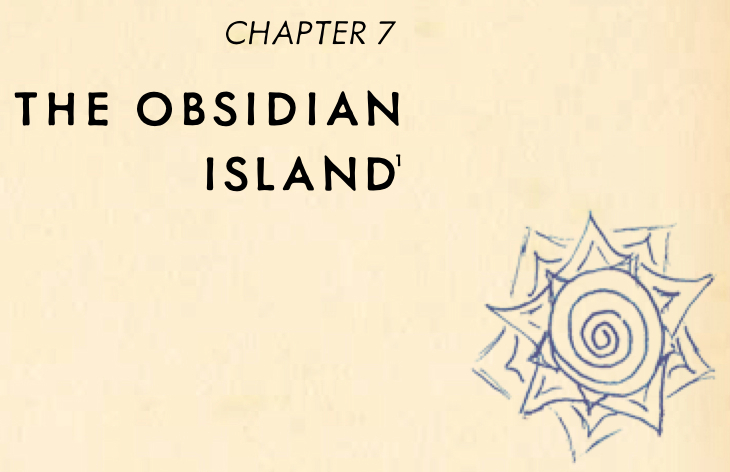 Who Is The Lady on Obsidian Island? Cambin plans, Maelstrom says. Y’got t’viz the Lady now. “Sola?” S. asks, perhaps too quickly. Maelstrom snorts. Dunt y’wish. Move y’self. Time’s scortin. On p266 (266 = 19*14), S. descends to the main deck of the ship and has a curious encounter with the pouting sailor – a female. She appears to be trying to teach the monkey to swab the deck, but it isn’t working. The monkey doesn’t seem to understand, and in fact ends up leaving a puddle of urine on the deck. 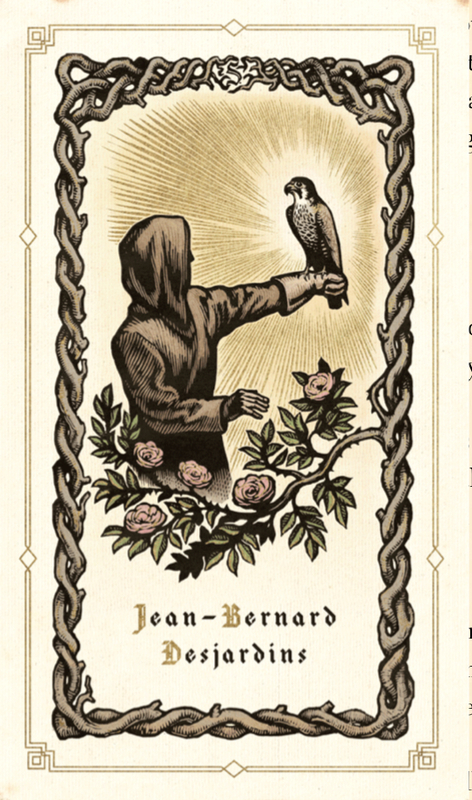 Back to the story on the deck between the woman and the monkey on p266 – if the monkey represents S., who does the woman represent? And what is she trying to teach S.? Just 19 pages later, on p285 (285=19*15), S. meets The Lady on Obsidian Island. In the pages that follow, we see that The Lady has pinprick scars around her lips and an obsidian piece around her neck (p287) – indicating that she was once a sailor on a ship, if not the ship. In addition, she tells S that she doesn’t live on the island and that the hunters have found us on the waters (p288). Found us. That means she is part of S’s ship. The Lady also bears the scars from a terrible burn accident. On p372, we see S. witness the remains of his ship after an attack by Vevoda’s warplanes. Every sailor on board is dead – including a reference to the body of the pouting sailor, floating face-down. As S. takes in this scene, all around him is the smell of burned flesh. On p286, Eric writes in pencil that The Lady looks like Floris of Bruges. Back on p266, FXC comments that one of the candidates that served as a model for the pouting sailor is Floris of Bruges. Is the female pouting sailor on S.’s ship also The Lady on Obsidian Island? And, if so, why her? And if she is, how are The Lady’s interactions with S. to be compared with the pouting sailor’s attempts to teach the monkey to swab the deck? The book of “S.” is about connections. Eric and Jen connect in the margins of a dusty old library book. S. and Sola connect in Ship of Theseus. Filomena Caldeira longs to connect to V.M. Straka in person. We, the readers, are attempting to connect all of the puzzle pieces hidden within the text into a picturesque whole. In every story, the antagonist has a specific mission. In “S.,” Vevoda’s purpose is ostensibly to grow rich by selling a new kind of weapon and to protect his interests at all costs. But the deeper story here is that Vevoda’s purpose is to sever connections. Let’s examine some specific scenes in the book that vividly illustrate Vevoda’s ill will in this manor. We are told in “S.” to follow the monkey. When we first see the monkey, he is connected to the organ grinder by a thin piece of rope “knotted through the organ grinder’s belt loop” (p8). The next time we see him, he is now disconnected from his master and running away from the organ owner’s dim-witted sons “trailing a rope that slaps softly over the street-stones” (p25). This happens as S. is being shanghaied – his first disconnection from Sola – and carried to a ship. His last thought before passing out is Run, monkey. Run. After the failed connection, the boy despondently loads his pockets with weights and prepares to throw himself into the sea. Ostrero, while trying to reconnect with his family, is disconnected from them forever. Corbeau, upon losing her connection to her lover, Stenfalk, will never be the same. 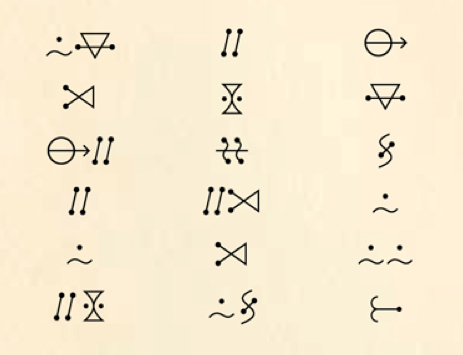 On the wall opposite him, S. notices some thing different—a set of symbols that looks like a numbering system. It’s a ledger of some sort, perhaps, fitting into the space between two figures who are both looking at it as if it were a solid thing. Immediately following this drawing of symbols that seem to connect two people-paintings who stare directly at it, everything changes. The walls look different now; the lines and colors are as precise as any S. has seen, but the images aren’t as dense. Fewer hands at work, perhaps—fewer people willing to walk this far into the caverns to paint. But the narrative is changing, too; the tribe seems to be splitting into factions. One group of figures is drawn carefully, lithe and graceful; the others look dashed-off, blocky and rough, with much less detail. The two groups now hunt separately. The two groups face off again and again in some sort of tribal meeting. After a while, S. notices another, more subtle difference: the bird-wolf spirits now appear only rarely, and even when they do, they are high above the human action, made small with distance. The K— become a disconnected people – disconnected from each other and from their once spiritual journey. The paintings thin out beyond this point. Shortly afterword, Pfeifer’s injury forces him to disconnect from the other two. He remains behind to face the detectives. The remainder of the chapter brings the connection between S. and Corbeau into sharp focus. After S. descends through an opening in the floor of the cave, Corbeau slips and falls, landing in his arms. At this precise moment, S. sees that familiar symbol painted on the wall of the cave. They then work together, physically tracing out an S as they navigate an S-curve and arrive at an opening in the cave high above the water. It is here that they hold hands in a very physical connection. And when they do, Vevoda’s detectives mock this connection with the words That’s so sweet. And then, as S. and Corbeau leap from the cave with hands clasped, they are separated by death as the bullets miss S. but fail to miss Corbeau (p197). That’s so sweet punctuates the separation that occurs even while the two fugitives remain attached in a fervent grip. Rewind to p130-131, when S. and Corbeau first hold hands. Jen comments in the margins That’s sweet, punctuating her connection to Eric, who admits leaving an S symbol on the cafe bulletin board to say hi. And these margin notes are written as “Corbeau tightens her grip on his hand.” It is at the precise moment that S. notices his infamous symbol not only once, but twice as a mirror image, etched in a design in the shutters in the home where they have hidden. Here we have the story of the connection between S. and Corbeau beginning with clasped hands and That’s sweet and S.‘s recognition of two S. symbols in the shutters. And their connection ends with clasped hands, That’s so sweet, and a single S. symbol on the cave wall seen moments before as S. holds Corbeau in his arms. Throughout “S.,” Vevoda continues to break connections. His business is war – the very definition of global disconnection. And toward the end of the book, as S. himself has chosen this path of violence in retaliation against Vevoda, he sees something very important. He is riding in a boat on his way to commit the assassination of Nemec, whom we later discover is actually Pfeifer, from the cave. As he does, he notices that Vevoda has destroyed the hills and the ancient symbols etched on their sides in order to harvest the substance of war. And one of those symbols, only partially destroyed, burns its way into S.‘s mind. The S. itself is broken. Disconnected. Missing a piece of itself. Unrecognizable unless you already know what the whole should look like. This is the state of S. in this moment. He, too, is broken and disconnected – missing a piece of his very self – symbolized by the death of the magpie as he runs from the palace guards. S. remains broken and disconnected more than ever during his stay in the Winter City of Chapter 9. Here he is unable to communicate with anyone, even though they are all around him. No one can connect with anyone – it is T.S. Eliot’s very definition of hell. This is the evil antagonist of “S.” – separation, disconnection, brokenness – hell itself. The only way to restore what is broken is to find connection. S. must find Sola. He must find himself and return from his own path of violence and disconnection. This must be where the story leads us. If we are to find the underlying clues that lead us to the richest cache of treasure found in the book, we must make connections. It is only then that we may solve the mystery, find ourselves, unite with others, and rediscover the spiritual side of ourselves that we have lost. There is a thematic similarity between the S.‘s opening walk to the tavern and the entire story in Ship of Theseus. Like a musical fugue, the introductory theme is played in a single voice, and then the rest of the piece is built around that theme. It is noted that this is a city of ancient and flawed geometries. This scene correlates to S‘s disorientation beginning with his awakening on the streets of the Old Quarter, his struggle to understand his identity, his capture and “imprisonment” aboard the ship, the floating stars above and the “drifting twins,” and the waterspout storm that destroys the ship and leads him to the city of B—. We see that this is a city of ancient and flawed arithmetics. We discover that the barrel organ man cheats the immigrant once in the dividing of profits, and again when he plans to send his “slow-witted but strong-armed sons” to attack the immigrant, grind his wrist bones to dust, and steal back even more. Then they will chase the monkey, attempt to sell it, and eventually try to kill it – but the monkey will escape. This scene mirrors S.‘s arrival at the city of B— and his eventual flight from Vevoda’s men. The uneven exchange between the organ grinder and organ owner is a metaphor for strike between Vevoda and the factory workers. The violence against the immigrant represents the bomb that goes off on the wharf. Vevoda’s detectives are mirrored in the barrel organ owner’s sons, and both men pursue an innocent bystander with hostile intentions – but both monkey and S. manage to escape. Run, monkey, run. This scene serves as a metaphor for S.’s life plunging into darkness as he runs from Vevoda and makes the conscious choice to become an vengeful assassin. The boys in the shadows are the Agents of Vevoda, and they hide from him because he represents the end of their “fun.” It is only S.‘s presence in the book that give momentary pause to the activities of the Agents of Vevoda as he pursues them and kills them, but it isn’t permanent. More emerge, and the light continues to lose its battle with darkness. Even S. himself is enshrouded in darkness as he pursues this unholy path. Struggling to stifle the giddy laughter of transgression, they wait for him to pass. this is what they know: the Boss’s name (Vévoda, they whisper to each other, with the giddy thrill of transgression) is being broadcast over a shortwave frequency and linked to all sorts of malfeasance and treachery. The harbormaster looks through his spyglass and apparently sees S‘s soon-to-be ship entering the harbor, but he does not recognize it because it seems so surreal. He shrugs and heads home to his mother. He walks on the glass of the broken streetlights and struggles to understand who would do such things. He passes S. and offers a greeting, but is ignored, sending him into a disgruntled walk home. This represents S‘s time in the Winter City, where everyone is in the same city but no one can see or talk to each other. Each lives in crowded isolation. Note that the harbormaster could see S‘s ship in the distance, just as S‘s ship waited in the distance off the shore of the Winter City outside the ice. The harbormaster’s desire for “comradeship and civility, the friendly hello, the small talk of a shared city” reflect S‘s own longing for the same as he spends his time in an arctic purgatory. This section covers most of the chapter Birds of Negative Space – until S. connects with Sola. S. arrives at the tavern and notes the “S.” symbol for the first time, revealed by a lone, unbroken streetlight. He senses it means something and enters the tavern. After longing for someone to recognize him, he sees Sola looking at him. He approaches her, sees her reading The Archer’s Tales, and sits down with her. Here, for the first time, he begins to feel a sense of identity. This scene is a metaphor for S‘s finally connecting with Sola – first at the end of Birds of Negative Space and then on through the end of the book in the final chapter, Ships of Theseus. Note that S. sees Sola reading the book The Archer’s Tales by Arquimedes de Sobreiro. At the end of Birds of Negative Space, Sola meets S. in the very apartment where Sobreiro lived – and died. She helps S. understand that he is connected to Sobreiro. “Different stories. Same tradition.”It is S.’s connection to Sola that gives him his sense of identity. Rather than continue to pursue the dark path of assassination and violence, he finds enlightenment. He sees himself, lit by that lone light. He is S. He gives up his path and leaves Vevoda alive. The two of them return to the ship (the ship that in the Obsidian Island book of “S.” has Sobreiro visible in the hull of every drawning of S.‘s ship). Now they are together and now things make sense. This section covers the last half of Birds of Negative Space as well as the entire chapter Ships of Theseus. This organization of the book lends more strength to the idea that the book Ship of Theseus is crafted in the manner of a musical fugue. And V.M. Straka, like J.S. Bach, has included riddles, ciphers, and puzzles for us to solve as the music plays. 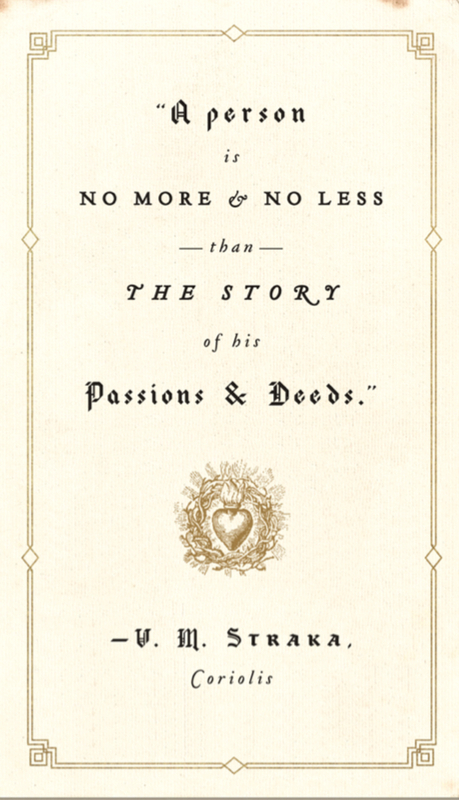 than the story of his passion and deeds. The card pictured above is found between pages 360 and 361. 361=19-squared. The card already struck me as significant. The numerology only adds weight to that. Important things happen on p361. Erich Husch reveals that Jean Bernard Desjardins married Signe Rabe in Carcassonne on 12/1/1952. The Church of St. Vincent in Carcassonne is on the Paris Meridian – the Rose Line. Did the wedding take place in this church on the Rose Line? Jen Heyward reveals that Signe Rabe was born on 11/4/1930 in Perpignan. The Perpignan economy is heavily dependent on the cork oak tree (quercus suber), also known as Sobreiro. The popular German Carcassonne board game is played by making connections with random tiles in such a way that roads connect to roads, fields connect to fields, and cities connect to cities. In the margins Eric connects Perpignan to Carcassonne, and Signe Rabe to Amarante Durand. This takes us back to the Glass Bead Game concept. We find in the text that Pfeifer, also known as Governor Nemec, has married a girl named Molyb, short for Molybdena. The atomic number for the element molybdenum is 42. We later discover that Molybdena’s sisters all have names that point to elements and lead to the substance. In LOST, 42 means the meaning of life, as it does in Hitchhiker’s Guide to the Galaxy. Compare this meaning to the quote on the card. Pfeifer is explaining to S that his life is really the sum of his choices (my paraphrase). This points back to the sentiment in the card. S. followed the monkey on the bank, carved into the tree, as instructed by Anca, to find the governor. His encounter with Pfeifer is a direct result of him following the monkey. There is the contrast of the man on the card holding a bird and standing amidst roses and the man Pfeifer/Nemec lying in the roses with the green fly on his nose. Roses are always important symbols to JJ. Abrams and in literature in general. They typically symbolize life, perfection, ultimate meaning, etc. Who is Edsel B. Grimshaw? Edsel B. Grimshaw is the writer of a scathing review of Ship of Theseus in 1950. He is mentioned in the marginalia by Eric Husch on p18 and p106 as hating a particular scene – the same scene mentioned in the review. The review itself is part of a post-production clue tweeted by author Doug Dorst on December 19. Why the name Grimshaw? Here are a few ideas. A grimshaw is a conundrum in chess that occurs when two black pieces mutually interfere with each other to block a checkmate by white. A real-world grimshaw appears to occur in Ship of Theseus on p453 in the climax. As Vévoda attempts to aim his pistol at the monkey (who is draining the wine barrels by removing the bungs), the following scene occurs. One of Vévoda’s guests chases the monkey—pointlessly, as the monkey never lets him get close, and the primary effect of his pursuit is to interfere with the raging Vévoda’s sight lines. Shortly afterward, Vévoda is “checkmated” by S and Sola. I’m not sure of the point of this, but it seems to me there is an emphasis on evil stumbling over itself before being defeated. Or are we simply being reminded that in the battle between good and evil, good does not defeat the evil one by killing him – only by placing him in a position where he has no moves left? There is also a connection to Gödel, Escher, Bach. Note that Edsel B. Grimshaw’s initials are EBG. 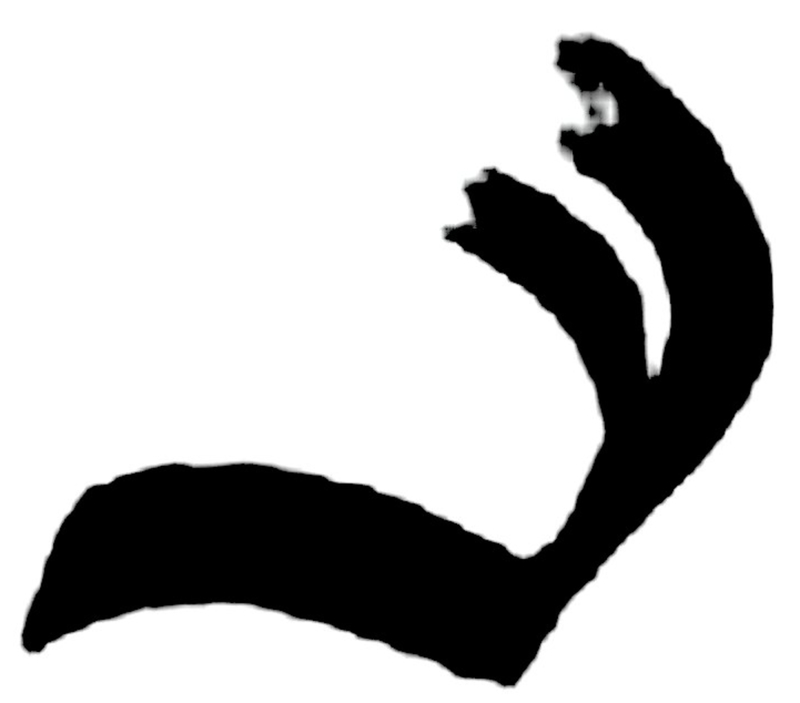 These are the same initials of a fictitious author mentioned in Gödel, Escher, Bach known as Egbert B. Gebstadter. It seems that the name Edsel B. Grimshaw (EBG) is a play on Douglas Hofstadter’s fictional character to get us thinking about the Eternal Golden Brain (EGB) in Gödel, Escher, Bach (GEB). Filomela refers to the proverbial million monkeys (ix) immediately following a mention of Covarrubias. S hides the valise in the hollowed trunk of a dying possumwood (p353). Another name for the possumwood tree is the monkey-no-climb. At the end, S envisions how he will obtain Maelstrom’s spyglass from its hiding place in the chart room – under the blankets where the monkey sleeps. 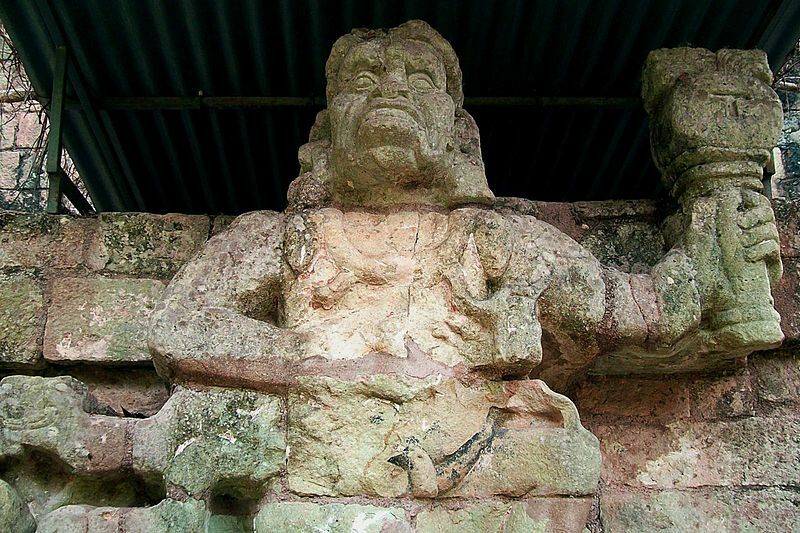 The last image of the monkey seems tantalizing – the hidden spyglass lay beneath the monkey. What does it mean to follow the monkey? 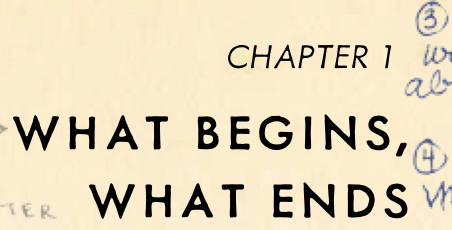 Chapter 1, What Begins, What Ends serves as a prologue to the overall story, and the organ grinder’s monkey serves as a symbol to this story. The monkey is tied down to a low-paying job, literally, with a rope. He is targeted for attack by the organ rental agency because the organ grinder was “stealing” funds. And yet it is the organ rental agency that has already stolen funds and now uses its resources to inflict great harm to both grinder and monkey. Near the end of the chapter, both S and monkey are in danger, and S roots for the monkey to escape. Vevoda is like the organ rental agency – he does unscrupulous business and inflicts bodily harm on those who get in his way. The monkey is an innocent bystander on the run, just like S.
Before descending into the depths of where the monkey leads next, I suggest you read my post Carl Jung and “S” to get your mind oriented. V.M. Straka’s Ship of Theseus is a Jungian journey into the collective unconscious. Or, as the Blue Man Group calls it, Rock Concert Movement #237. Perhaps the monkey as a symbol for the collective unconscious came from this famous story of the 100 Monkeys. The monkey is one of many symbols in the book that help us understand what is going on in S‘s unconscious mind – and ultimately ours. And since S does not realize he has descended into his unconscious, the symbols around him seem foreign with a life of their own, but they serve to help us understand S more deeply. As you follow the monkey in the story, he (like S) is a passenger on the xebec after some unknown tragedy at sea occurs. He tries to find his place on the ship, but cannot communicate with the sailors. He does not work with the rest of the crew. The monkey jumps down the hatch when the waterspout approaches, illustrating S‘s own fear. S himself does not go down the hatch – the monkey is a metaphor for his feelings. These are the obvious parallels. Some parallels are difficult to understand, such as when S and the monkey are seemingly at odds with one another. This represents the unconscious struggles we have with our very selves in certain situations. For example, the monkey is shrieking and swinging in the halyard apparently having fun while S is stupefied that the ship even exists. The monkey swings back and forth over the ship, as do S‘s eyes wander in wonderment at the vessel. The monkey shrieks as he swings, indicating the shouts of amazement that S feels inside over his astonishment. One of the most interesting monkey encounters is as S attempts to communicate with the pouting female sailor. The monkey encircles the sailor, jabbering away as if to taunt her for having her mouth stitched shut. At the same time, S approaches the sailor and “jabbers away” as well, attempting to get her to communicate. She seems to have one mission – to mop the deck. She wanted the monkey to help, but he doesn’t. In fact, he leaves a puddle of urine on it after she has cleaned it. This is representative of what S does with the sailor. She has one purpose – to clean the ship with mop and holystone. She, another symbol of his unconscious, is trying to help S understand himself by cleaning away what obscures. But he doesn’t understand. And his failure to understand sends her away in a huff. He has urinated on her work. When S dreams that the monkey is on Sola’s back, still and peaceful – this represents the work Sola is trying to accomplish. She, too, wants S. to understand himself. Know thyself, she seems to say in all of her encounters with S.
As S “follows the monkey” (finding the path to the governor’s residence), it is here that he begins to truly understand himself. He finds the path of the monkey, but where does it lead him? Pfeifer. The enemy without has now become the enemy within one of S’s innermost circles at one point in his life. Has S, like Pfeifer, become the very man he set out to destroy? Has his quest for good led him to be just as evil as Vevoda – killing those that stand in his way? It seems so, because just as S decides to go ahead and kill Pfeifer, a shot rings out and kills a Magpie as he flees. The European Magpie, self-aware and colored black and white. Two players, two sides. One is light. One is dark. (Ok, that’s from LOST, but the same concept is at work here.) The monkey has led us to this deep, internal struggle between good and evil that exists deep in the unconscious of S – and of you and I. And finally, in the climax, we see that rather than kill a thousand people and murder Vevoda, S merely has the heir to the throne drink just enough avis veritatas (bird of truth) to be honest with himself and the crowd. Vevoda is left alive, and the monkey does overcomes evil with S‘s newfound truth: evil is drained of its power when S. ceases to fight it on its own terms. Do not overcome evil with evil, but overcome evil with good as the good book says. In the end, when S has finally realized this truth and internalized it deep in his unconscious, he is finally able to see himself clearly. He finds the spyglass, underneath the sleeping monkey’s perch, and is able to see a new ship – reconstructed and ready to sail the high seas with Sola by his side. See? This whole final sequence was hers from the monkey’s appearance on. Eric and Jen are now apparently have the original VMS manuscript for Ship of Theseus. It appears FXC changed the ending from the monkey’s appearance on (Straka’s version gave Jen nightmares – p452). Meaning? That FXC was trying to convince VMS (if he was still alive) and his readers that there is a better way. We are all dying to know that Straka’s version is, I’m sure. But that is the point – which ending will we write in our own lives for similar struggles? What will we decide for ourSelves?